This post has a soundtrack. Take a second to start the video below. Like it or not, I am in the big fish business. I hate admitting it, but that’s how it started. I carried a camera to take photos of fish and the small ones were not the fish who got photographed. Eventually folks started to buy the photos I took and I found there was a simple equation. The bigger the fish, the faster the sale. That’s a pretty hard-nosed view of fly fishing and I’m not especially proud of it. Call it skill or luck or hard work, a lot of big fish have come my way. I’m grateful for each of them. I hope there will be many more but I no longer measure myself in inches or pounds of fish. Not because I’m above it or used to it or jaded about it. I still like to catch big fish but I’ve come to understand my place in the equation. Sometimes I choose the fish. I plan, I strategize, I stalk and pursue. Often, by force of will, I bring the fish to me. Sometimes I choose the fish, but every time the fish chooses me. I think about this when I am swinging a fly for steelhead. Like a practitioner of tai chi, I mind my swing. Seeking always the perfect presentation. Mindful and empty, dreaming not of what was or what may be, simply present in what is. It is in that moment that the fish chooses me. I accept that all I have done is to make myself available to him. It is not done without skill or planning. It is not an accident. It is the culmination of years of effort but I recognize that it is a culmination for him as well. It is not a thing I have done alone. I have not brought the fish to me, something larger has brought us together. In that convergence there is something that defies explanation. Among the thousands of fish that have passed in and out of my hands, some are special. I can not always say why. Once in a while a fish connects with me in a way that is deeper than either of us can grasp. There is a convergence of place and time, of hand and heart the sum of which is greater than the two of us. One of these fish is worth a year of my life. That is, at least, about what I spend for them. This year there have been two. Both trout. One was the largest trout I have yet to catch, the other the smallest. Two fish sent to me like a message in a bottle. A note cast to the waves in search of a reader and finding its way to me. Each fish was special. Each was wild. Each was native. Each a perfect example of its kind. A steelhead from British Colombia and a Southern Appalachian Brook Trout from North Georgia. Each came to me at a special time and in a special place. Each fish chose me. Maybe an inch and a half in length, this little brook trout is the one I want to show you. Not because he’s big, not because he was a challenge. Not because of what he says about me, but because of what he says to me. 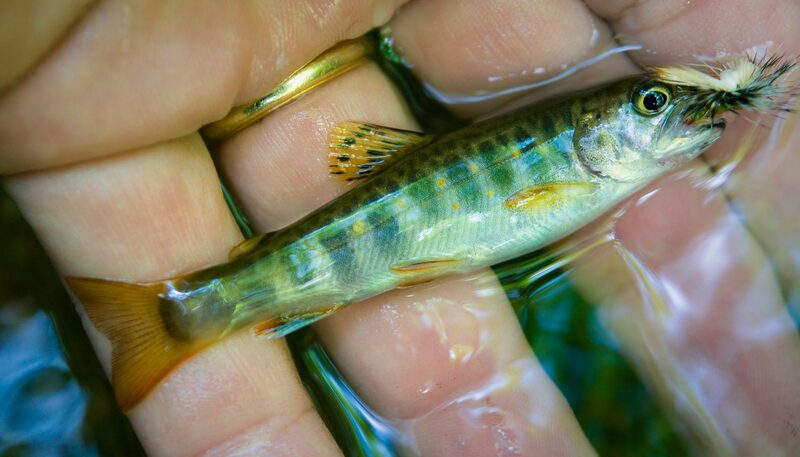 Perfect and beautiful, this rare native fish is a reminder to all of us to be thankful for what we have. Thankful for the days we have to spend on the water. Thankful for the beautiful places where we fish. Thankful for the friends we share them with. And thankful for the fish that choose us. I may never catch a fish this small again. I may never catch another fish at all. I may never again step foot in the stream. Each of our futures is untold. Mine, his and yours. In the moment we spent together this is what was shared. This was the message. This is what the little fish told me. This entry was posted in The Hot Ticket, Trout Fishing by Louis Cahill. Bookmark the permalink. I was on the Yampa in Colorado, and caught several really nice fish. But amongst the fish that stand out 2 years later was not one of the big ones. I was floating dries through a run across from me, and as the fly reached the end of the run, the current would pull it under and it would swing in to the shallows below me, where I would feel a tap on the line. I was curious about it, so I repeated it several times, with several taps. Finally a tap became the smallest brown trout I have ever caught. A two and a half inch stream born cutie whose mouth was smaller than the fly. I still smile when I think of that little guy. I remember the ones I didn’t catch! Great piece – thanks for posting. I mostly fish small streams and creeks here in Victoria, Australia. The trout are mostly small but sometimes they can be surprising when they nudge 14 inches or more. The smallest trout I’ve caught was around the two and a half inch mark and was so light that I thought I’d snagged a fallen eucalyptus leaf. The memory of it does make me smile and laugh. Knowing that it was completely wild born and that it had started life way upstream somewhere is a pleasant thought. This season I’m hoping to catch some of the native galaxiad minnows that live in my local streams. I often see my too large for them fly being buffeted as they try to take it. Might have to tie on the size 20 midges or nymphs that I have in one of my boxes. I’ll probably meed a pair of those magnifying spectacles to tie them on!